asus maximus apex x. processor 8700k. 2x8 f4-4000MHz c18-19-39. If you install a single module, the motherboard will give 55 code errors. the other module normally opens. I have a low xmp score. normally open when double module is installed. but again a low score. and if I want to do some overclocking, I get a lower score. motherboard bios today. I also have the f4-3200c16 kit, I tried it but I did not see any problems. what can I do. Test the single module standalone for errors with MemTest86 at default settings. Have you tried if Maximus Tweak at Mode 1 or Mode 2 instead of AUTO improves performance? 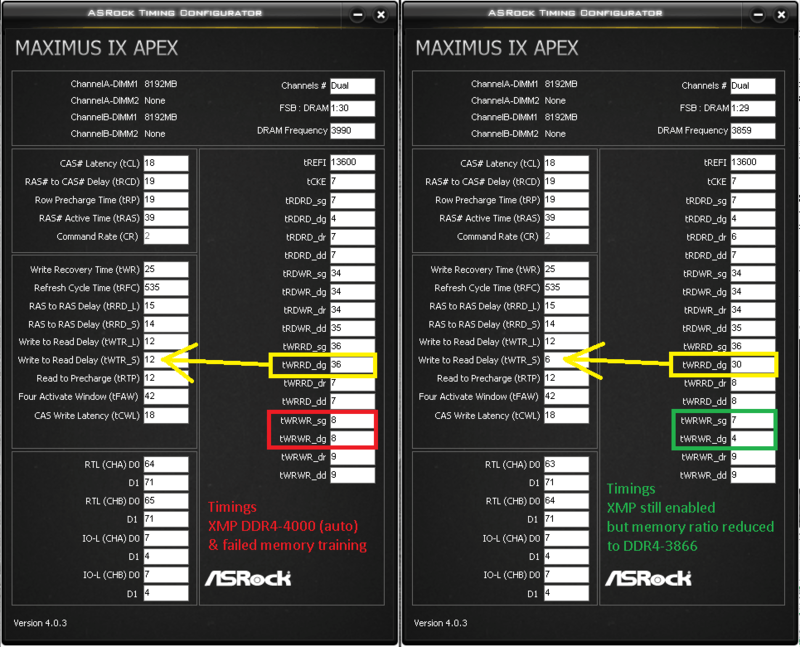 It looks like the mainboard failed to properly train subtimings during memory training for screenshot #2 and #3. Can you show a screenshot with the Aida64 Benchmark and ASRock Timing Configurator or ASUS MemTweakIt, so i can take a look at the subtimings? The system can not boot in mode 1 or auto. 55 or 18 qcode error. If mode 2 is selected, it will open but lower score. If the motherboard or CPU is a problem, the same is true for the F4-3200 kit. but the F4-3200 responds to no overclocking problems and no performance problems.no problem. I just checked your timings for XMP + Mode 2 and it looks like the board failed to properly train some of the subtimings. That is the reason why the performance numbers are so low. I just looked through my screenshots and sadly did not find one for the vanilla XMP with MemTweakIt in it, but can make you one later today. You would then have to manually adjust some subtimings and run some performance and stability checks afterwards. The other option would be to reduce the memory ratio with the XMP still enabled, until your board does POST reliably and properly trains the subtimings (= without reduced memory performance). the first module can not make sub-timings. the other module makes sub-timings. it did not seem normal to me. I used different model ram. I am experiencing the first time with manual sub time adjustment. The memory training failing usually only ever happens at the upper end of supported memory speeds for the specific mainboard. So when using lower frequency kits it is very unlikely to encounter this issue, especially with a higher end motherboard. 1) Make a screenshot for the XMP with performance numbers and timings for comparison. Here both write and copy bandwidth in the Aida64 Memory Benchmark seem very low which does hint at a problem with the trained timings. 2) While keeping the XMP enabled, reduce the memory ratio until performance numbers are back to normal / in their expected range. In some cases it might be necessary to go down more than one step. 3) Compare the timings between the two and look for values that are way off. Note these timings and their values for manual adjustment. If there are more then just a few and you are unsure which are the importent ones, maybe ask someone with more experience manualy adjusting timings. Otherwise just try them one by one and find out by yourself which of them restore the memory performance. 4) XMP enabled with manually adjusted timings: tWRWR_sg = 7 and tWRWR_dg = 4 ( + tWRRD_dg = 30, optional). In my case I could use the values from the reduced ratio setting 1:1 and did not need to raise or lower them at all. In some cases it might be needed to increase them a bit, if the system does otherwise not start or fails stability testing. Last edited by emissary42; 05-03-2018, 05:51 AM. why is this necessary? motherboard support is limited. 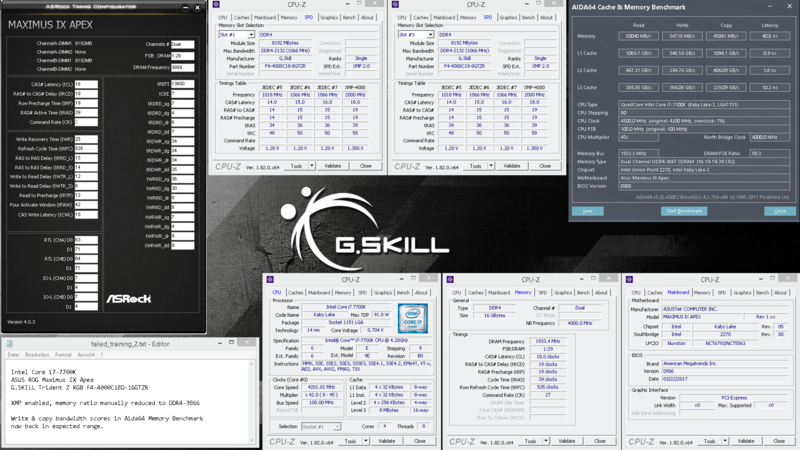 also if we want to overclock tming, such as lowering the c17, the settings will still degrade and give poor performance. The way you say works. we must set the sub times manually. I reached these values with v1.48. I do not know good or bad. the problem does not seem to be happening right now. Performance looks a lot better now. There might still be some room for optimization. Also keep an eye on RTL / IO-L, in your screenshot channel B got mistrained to 67/13, while it should be 61/7 or 62/7 with proper training. I reach new values. I do not know what the situation is for IO / and SA / daily use. I'm not sure I gave it a lot of volts. Can we be stable? I / O and s / a volts 1.4 continuous. xmp activates itself. it will not be stable. do these settings cause system corruption? Nice that it passes hci memtest 1000%. Are you still using the same voltages? How is it so far?